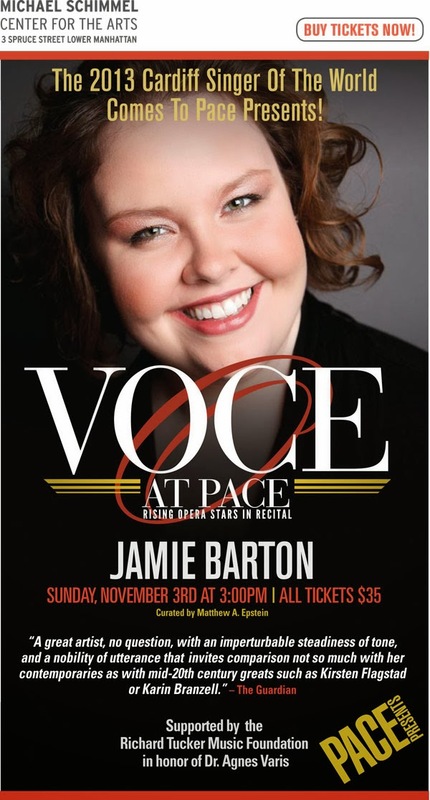 Today, we went to the first Voce at Pace: Rising Opera Stars in Recital supported by the Richard Tucker Music Foundation in honor of the late Dr. Agnes Varis. 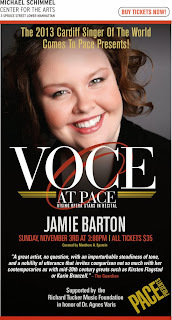 The first singer to kick of the series was mezzo-soprano Jamie Barton. Jamie sang cycles by Purcell/Britten, Brahms, Sibelius, Ives, and Elgar. Her encores included Neverland from Peter Pan and Stella del marinar from La Giocanda. The Purcell/Britten and Brahms were lovely and she really let loose on the Sibelius. I swear I levitated right out of my seat during the Elgar "Sea Pictures" cycle. Jamie, along with accompanist Bradley Moore, presented an absolutely thrilling recital!